Download "Select Your Retirement Plan"
2 Introduction 1 What s Inside The Retirement Plans... 1 Enroll in Your Chosen Plan... 2 Investment Providers... 3 Selecting the Right Plan to Fit Your Needs Questions and Answers... 9 THIS DOCUMENT CONTAINS AN ABBREVIATED DESCRIPTION OF THE RETIREMENT BENEFITS OFFERED BY THE SOUTH CAROLINA RETIRE- MENT SYSTEMS. THE INFORMATION IN THIS DOCUMENT IS MEANT TO SERVE AS A GUIDE FOR OUR MEMBERS AND DOES NOT CONSTITUTE A BINDING REPRESENTATION OF THE SOUTH CAROLINA RETIREMENT SYSTEMS. TITLE 9 OF THE SOUTH CAROLINA CODE OF LAWS CON- TAINS A COMPLETE DESCRIPTION OF THE RETIREMENT BENEFITS, THEIR TERMS AND CONDITIONS, AND GOVERNS ALL RETIREMENT BENEFITS OFFERED BY THE STATE. STATE STATUTES ARE SUBJECT TO CHANGE BY THE GENERAL ASSEMBLY. PLEASE CONTACT THE RETIRE- MENT SYSTEMS FOR THE MOST CURRENT INFORMATION. THE LANGUAGE USED IN THIS DOCUMENT DOES NOT CREATE ANY CONTRACTUAL RIGHTS OR ENTITLEMENTS AND DOES NOT CREATE A CONTRACT BETWEEN THE MEMBER AND THE SOUTH CAROLINA RE- TIREMENT SYSTEMS. THE SOUTH CAROLINA RETIREMENT SYSTEMS RESERVES THE RIGHT TO REVISE THE CONTENT OF THIS DOCUMENT. Welcome As a new employee, you have a number of decisions to make and what seems like countless forms to complete. Choosing which of the two available retirement plans to join is one of these decisions. To assist you in making this decision and to help enable you to make an informed choice, this guide provides information about the two plans from which you may choose. This guide includes a comparison of the two plans as well. Eligibility All newly hired state, public school, and public higher education employees, and individuals elected to the South Carolina General Assembly in November 2012 and after, are eligible to choose between the two available plans. This includes all permanent full-time employees, temporary and part-time employees, and political appointees. You must select one of the two available retirement plans unless your position is exempted by state law. Your employer can tell you whether your position is exempt from mandatory participation/membership. 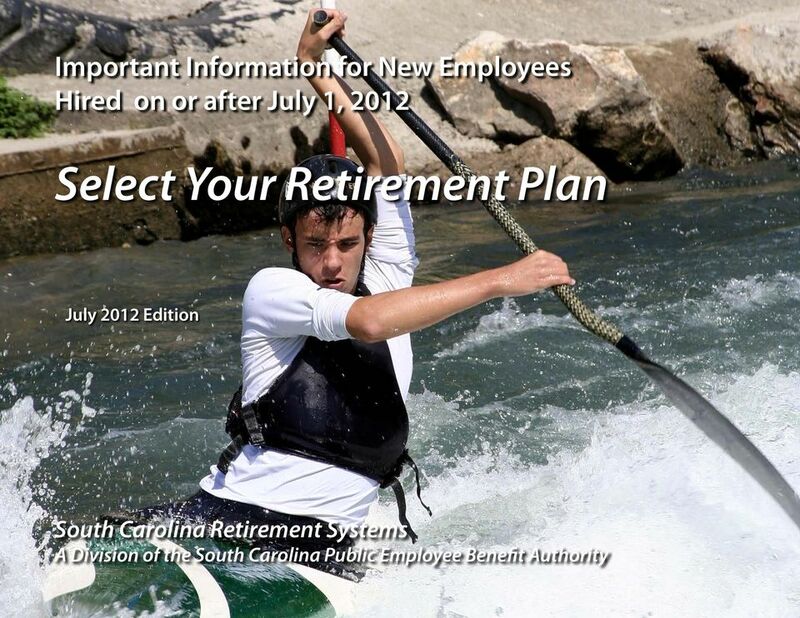 The South Carolina Retirement System (SCRS) information in this guide applies to Class Three members which are employees with dates of membership after July 1, South Carolina Retirement System The South Carolina Retirement System (SCRS) is a defined benefit plan. In a defined benefit plan, the plan bears the investment risk and provides a monthly annuity based on a statutory formula rather than basing your benefit on your account balance. A Quick Look at SCRS Ü If you select SCRS, your employee contributions will be placed in an SCRS account in your name that earns 4 percent interest annually. Ü SCRS provides members a monthly annuity based on a formula that includes average final compensation, years of service, and a 1.82 percent benefit multiplier. Ü You must have a minimum of eight years of earned service to be eligible to receive a retirement annuity. Once you retire, your annuity will be paid to you monthly. Ü If you terminate covered employment and receive a refund of your contributions, your employer s contributions will not be refunded to you. The Retirement Plans State Optional Retirement Program The State Optional Retirement Program (State ORP) is a defined contribution plan. In a defined contribution plan, you choose how to invest your funds within the plan s investment options and then you bear the risk, or enjoy the benefit, based on the performance of your individual investments. Your retirement benefit is based on the balance in your account when you retire. A Quick Look at State ORP Ü If you select State ORP, an account is established in your name through the investment provider you select. Your employee contributions and a portion of your employer s contributions accumulate in your account and are invested in the investment products you select from the products offered through your investment provider. Ü Your retirement benefit will be based on the balance in your account when you retire. Ü Once you retire, you may choose from a variety of payment options, including single-sum withdrawals, systematic withdrawals, or a guaranteed monthly annuity limited to your account balance at the time payments begin. Ü State ORP also provides portability of the money in your account, which includes your contributions, your portion of your employer s contributions, and your investment earnings. 4 4 5 Consider SCRS if you: Ü Want a monthly benefit that is not affected by fluctuations in the financial markets The plan bears the investment risk. Ü Plan to stay with a covered employer for many years If you have many years of service, the defined benefit formula may provide a larger benefit. Your benefit increases with each year you work and contribute as an active member. Ü Prefer that someone else makes investment decisions The South Carolina Retirement System Investment Commission contracts with and monitors professional investment managers. Ü Need disability protection as part of your plan Disability protection is included. Ü Need continuing survivor benefits for your beneficiary Monthly survivor benefit for your beneficiary if you die in service with 15 or more years of service, or at age 60 with at least eight years of earned service. Selecting the Right Plan to Fit Your Needs Consider State ORP if you: Ü Are interested in selecting how to invest your money and monitoring the growth of your account You choose and direct your investments in professionally managed mutual funds and other investment products. You have an opportunity for increased retirement income based on your investment decisions. Ü Do not plan to stay with a covered employer for many years or until retirement If you terminate employment and request a refund, you will receive your employee contributions, the portion of the contributions your employer made into your account, and any investment earnings. ÜWant a portable retirement plan Portability provides an opportunity for more retirement income if you change employers several times during your career. You can transfer balances to other eligible retirement plans or an Individual Retirement Account (IRA) upon distribution. Ü Want flexibility in the way you or your beneficiary receive your benefit Flexible benefit options such as annuity payments (including payments you should not outlive), a lump-sum distribution, partial distributions, or withdrawals. Plan Type Eligibility Employee Contributions Employer Contributions Refund before Retirement and Portability SCRS is a 401(a) qualified governmental plan that provides a monthly annuity at retirement. The contributions made by you and your employer, and the investment earnings on those contributions are used to fund retirement benefits. Your retirement annuity is based on a formula that includes your service credit, your average final compensation, and a benefit multiplier of 1.82 percent. Your retirement income is not based on your account balance. All public school employees, public higher education personnel, state employees, employees of other political subdivisions that participate in the Retirement Systems, and individuals elected to the South Carolina General Assembly in November 2012 and after are eligible for membership. You are eligible on your date of hire if you are a permanent full-time or part-time employee. If you are a temporary or non-permanent employee, you may irrevocably choose whether to join unless you are a retiree of SCRS or have money on account with SCRS. Employee contribution rates are established by the South Carolina General Assembly. The current employee contribution rate is a tax-deferred 7.0 percent of your gross pay. The employee contribution will increase to 7.5 percent effective July 1, 2013, and to 8.0 percent effective July 1, Current employer contribution rates are established by the S.C. Public Employee Benefit Authority. The employer contribution is based on a percentage of a member s earnable compensation. The employer contribution is used by the Retirement Systems to fund benefits and to cover any reasonable expenses incurred in performing services regarding the plan. If you terminate employment with at least eight years of earned service and leave your contributions plus interest in your SCRS account, you will be eligible to receive a deferred monthly annuity at age 60. If you terminate employment, you may request a refund of your employee contributions plus interest, but you forfeit your rights to any future retirement benefits. Employer contributions are not refunded. There is a 90-day waiting period from your termination date before a refund can be made. You are not required to withdraw your contributions and interest at termination. Deferred employee contributions plus interest may be rolled over to another eligible retirement plan or an Individual Retirement Account (IRA) as allowed by the Internal Revenue Code (IRC). Eligibility to establish SCRS service with another retirement plan depends on the other plan s provisions. The State ORP is a 401(a) qualified governmental plan that provides an account into which you and your employer contribute. Your retirement income is based on the account balance accumulated throughout your years of employment. Your account balance is a combination of contributions and the performance of the investment funds you select from the investment options offered through your chosen State ORP investment provider. All newly hired state, public school, and public higher education employees, and individuals elected to the South Carolina General Assembly in November 2012 and after, who are also eligible for SCRS membership are eligible for State ORP participation. This includes all permanent full-time employees, temporary and part-time employees, and political appointees. Same as SCRS. Your employer remits a contribution equal to five percent of your compensation to your chosen investment provider for allocation to your account. The remaining percentage is sent to the Retirement Systems. You have immediate rights to your account balance, including employee and your portion of employer contributions. If you terminate employment or reach age 59 ½, you may request a refund of your account balance, which includes employee and your portion of employer contributions. Your State ORP investments remain in the investment products you select unless you request that they be transferred or rolled over to another eligible retirement plan, or unless that investment product is no longer offered. You can change jobs without losing your accumulated retirement benefits. You may participate in similar plans through other employers. You may roll over your account balance to another eligible retirement plan or an IRA as allowed by the IRC. Eligibility to establish State ORP service with another retirement plan depends on the other plan s provisions. 5 6 7 Management of Retirement Funds Selection of Investment Provider The plan assumes all investment risk. The S.C. Retirement System Investment Commission has the fiduciary responsibility to invest the funds, and professional investment managers approved by the Investment Commission manage the portfolios. You assume all investment risk. You are responsible for your investment choices, distribution methods, and retirement goals. The director of the South Carolina Retirement Systems designates the professional money management companies (investment providers) authorized to offer investment products. You choose one of the four authorized investment providers. You may change providers once each year during the annual open enrollment period (January 1 to March 1). Disability Benefits If you are an active SCRS member with at least eight years of earned service credit, you may apply for disability retirement if you become physically or mentally incapable of performing the regular duties of your job and your disability is likely to be permanent. The five-year requirement may be waived if your disability is the result of a job-related injury. Service will be projected to age 65 with an applicable actuarial reduction. Benefits may be paid for life or for the duration of your disability. The Retirement Systems must receive your disability retirement application within 90 days of the date of your termination from covered employment. There is no disability protection. Selection of Investment Products Allocation of Contributions Beneficiary Additional Service Buy-in Options You may name as many beneficiaries and/or trustees as you wish. Multiple beneficiaries share equally in survivor benefits. Active members may establish additional service credit for various types of previous employment or leaves of absence, and up to five years of nonqualified service. You may purchase service credit by lump-sum payment, an installment service purchase (pre- or after-tax, plus interest), or a taxdeferred rollover from an eligible retirement plan, such as an IRA, a 401(a), a 401(k), a 457, or a 403(b). You select from the available investment funds to reach an appropriate asset allocation for your investment objectives and retirement goals. The prospectus for each investment product provides information on that particular product. Investment provider service representatives are available toll free by telephone to assist with your selections. A list of the vendors providing the investment products and the products offered to State ORP participants is on the Retirement Systems website at default.htm. You may also contact Customer Services at , toll free at , or at contact/default. htm. You allocate your contributions into your chosen investment products. Contact your investment provider to change the allocation of your contributions and/or existing account balance. You may name as many beneficiaries and/or trustees as you wish. In-Service Death Benefits Active Member Incidental Death Benefit Retired Member Incidental Death Benefit If you die while employed as a member at any age and have 15 or more years of service (eight of which must be earned service), or after reaching age 60 with eight years of earned service, your beneficiary may choose a refund of employee contributions plus interest or a monthly annuity. The monthly annuity is not available if you name your estate as beneficiary or if you are under age 60 and have fewer than 15 years of active service at the time of your death. If your employer provides incidental death benefit coverage and you die in service with at least one year of service credit, a payment equal to your current annual earnable compensation will be made to your designated beneficiary. If your death is the result of a job-related injury, the one-year requirement is waived. Non-Working Retired Member As a non-working retiree, if you die and your last employer prior to retirement provides incidental death benefit coverage, a payment based on your service credit at retirement will be made to your designated beneficiary: years = $2,000; years = $4,000; and 30 or more years = $6,000. Working Retired Member If you die while you are a working retired member and your employer provides incidental death benefit coverage, a payment equal to your current annual earnable compensation will be made to your designated beneficiary. The benefit is based on the cash value of your account as of your date of death. Your beneficiary may receive the cash value of your account through annuities, lump-sum distributions, or periodic withdrawals, all of which are available through the investment providers. If your employer provides incidental death benefit coverage and you die in service with at least one year of service credit, a payment equal to your current annual earnable compensation will be made to your designated beneficiary. If your death is the result of a job-related injury, the one-year requirement is waived. Non-Working Retired State ORP Participant There is no post-retirement incidental death benefit for non-working State ORP participants. Working Retired State ORP Participant If you die while you are a working retired participant and your employer provides incidental death benefit coverage, a payment equal to your current annual earnable compensation will be made to your designated beneficiary. 6 8 9 Questions and Answers Minimum Service Requirement for Retirement Benefits Retirement Benefit Calculation Retirement Payment Options Deferred Retirement Option Program Benefit Adjustments Post-Retirement Health Insurance Eligibility Normal Retirement (Unreduced Benefit) You are eligible to retire once your age and your years of service total 90. For example, if you begin covered employment at age 22 and remain with a covered employer, once you reach age 56, you will have 34 years of service. Your age (56) plus your years of service (34) total 90, which would make you eligible for service retirement. Your annual SCRS retirement benefit is based on the following formula: Step 1 Determine your average final compensation (20 highest consecutive quarters of earnable compensation divided by 5). Step 2 Multiply the result of Step 1 by 1.82 percent (.0182). Step 3 Multiply the result of Step 2 by your years of service credit. Step 4 Deduct early retirement penalties, if applicable. Your retirement benefit will be paid as a monthly annuity for your lifetime. There are two payment options that will provide monthly payments to a survivor in the event of your death. The available payment options are: Option A Option B Option C Maximum Retiree Only Monthly Annuity 100% - 100% Joint Retiree-Survivor Monthly Annuity with revert to Option A feature 100% - 50% Joint Retiree-Survivor Monthly Annuity with revert to Option A feature If you choose Option B or Option C, you will receive a reduced (from Option A) annuity. Age differential restrictions may apply to non-spousal beneficiaries. State law currently provides that each July 1 eligible SCRS retirees should receive an automatic benefit adjustment of 1 percent of their annuity up to a maximum of $500. 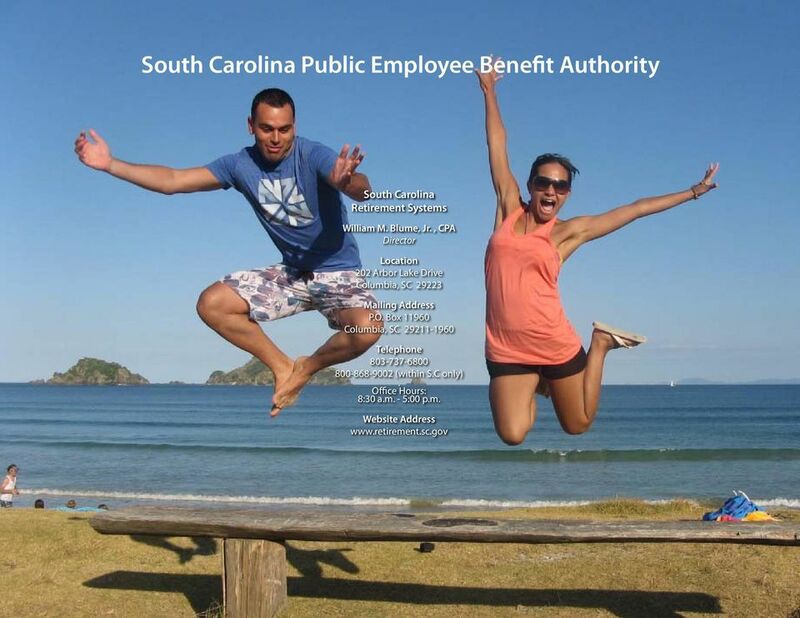 Contact the SC Public Employee Benefit Authority Employee Insurance Program at or toll free at , or contact your benefits administrator for more information. There is no minimum age or years of service required for retirement. You become eligible to receive distributions when you terminate employment or reach age 59 ½. You may leave your balance on deposit to accumulate earnings tax-deferred until you elect to receive them or until you reach age 70 ½ and are required by the IRS to begin receiving annual required minimum distributions. The amount of your State ORP benefit is based on the total accumulation in your account(s) and the payment method you choose. Your benefit is affected by the performance of the investments you select, the amount of time you have to invest, and the amount of time over which you expect to receive benefits. You may choose to purchase an annuity or take a lump-sum distribution, partial distributions, or withdrawals. The State ORP investment providers offer a variety of retirement payment options designed to allow you to tailor your retirement plan to meet your financial needs. In the event of your death, your beneficiary may receive the cash value of your account through annuities, lump-sum distributions, or periodic withdrawals. The State ORP does not provide benefit adjustments. Same as SCRS. How do I enroll in State ORP or SCRS? Your employer will provide you with the required enrollment form for the plan you select and will submit your completed form to the Retirement Systems. How many State ORP investment providers are there to choose from? The four authorized investment providers are listed on Page 3 of this guide and on our website at www. retirement.sc.gov/orp/default.htm. How do I obtain an account balance for either plan? State ORP participants will receive periodic financial statements from their investment provider. SCRS members may obtain a member statement through online Member Access at sc.gov/memberaccess/welcome or by contacting the Retirement Systems. If I elect State ORP participation and stay with the same employer, can I ever join SCRS? Yes. There is an annual open enrollment period (January 1 to March 1) during which you may irrevocably elect membership in SCRS if you have between one and five years of State ORP service. If you do not make the election during any of the five annual open enrollment periods in which you are eligible to irrevocably elect SCRS membership, you will, by default, continue your State ORP participation and forfeit your opportunity to elect SCRS membership. If I retire under SCRS, may I join State ORP? No. If you retire under SCRS, you are not eligible for enrollment in SCRS and therefore may not join State ORP. Can my employer help me choose a plan? Your benefits administrator can assist you by providing you with this guide and directing you to the It s Your Choice: SCRS or State ORP video 1 on the Retirement Systems website. Use these materials, as well as the online benefit comparison program for State ORP (see Page 2 of this guide), to learn about both plans so you can make an informed choice. Your benefits administrator cannot tell you which plan is better for you; only you can make that choice. You may also contact the Retirement Systems for assistance, but remember, the Retirement Systems cannot make your selection for you either. What if I have a problem with my State ORP investment provider? You or your employer should report any problems concerning the investment providers to the Retirement Systems. What happens if I elect State ORP but don t make my investment selections? The money will default to a nonrestrictive investment account. If I elect State ORP, can I change my investment options at any time? Yes, but any changes to your investment options are subject to your State ORP investment provider s contractual limitations. If I elect State ORP, can I allocate my contributions to more than one investment option? Yes. The employee and employer contributions may be allocated to any of the authorized investment products offered by your investment provider. 1 As of July 1, 2012, the It s Your Choice: SCRS or State ORP video is temporarily unavailable. If I change State ORP investment providers, what happens to my account balance? If you change investment providers during an annual open enrollment period (January 1 to March 1), you may transfer your account balance, subject to your State ORP investment provider s contractual limitations, to the new investment provider. How does State ORP participation or SCRS membership affect supplemental defined contribution retirement plan contributions? You may still contribute to a 457 or 401(k) deferred compensation plan, or to a 403(b) tax-sheltered annuity; however, your contribution limits and options may depend on the type(s) of supplemental plans you select. You may want to contact a tax consultant or a financial advisor for more information. How will investment risk affect my retirement account? Investment risk is the uncertainty of how a given investment will perform. In State ORP, if the investments you select perform well, your retirement account will grow quickly and provide a larger benefit when you retire. If your investments do not perform well, you will not have as large a benefit at retirement. The potential for higher returns is generally greater with investments that carry more risk. Allocating investments into several asset classes, such as bonds, large cap equities, international equities, and small cap equities, may help reduce your overall risk. With SCRS, the plan bears the investment risk. PEBA Retirement Benefits must receive your disability retirement application within 90 days of the date of your termination from covered employment. Plan Comparison Guide The Virginia Retirement System Plan Comparison Guide provides a quick look at some of the similarities and differences among VRS Plan 1, VRS Plan 2 and the Hybrid Retirement Plan.